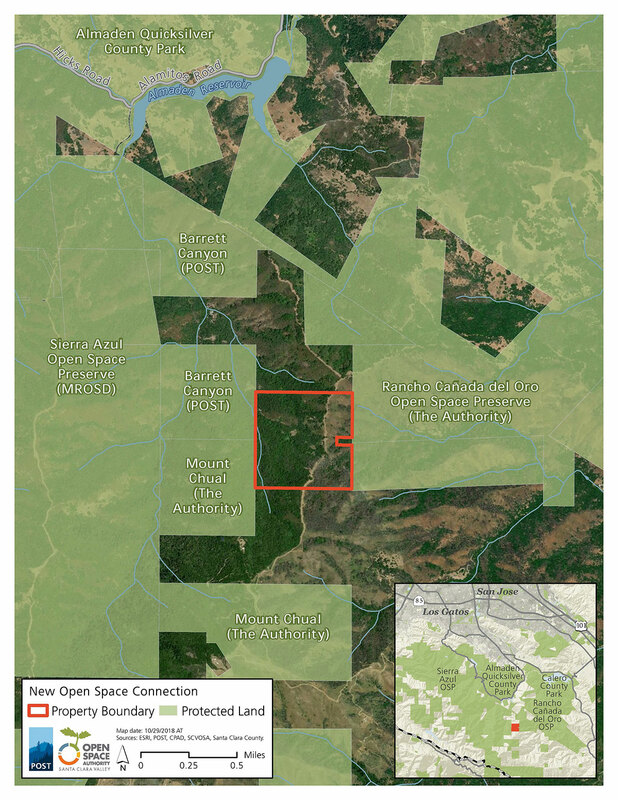 (Palo Alto, Calif.)—Peninsula Open Space Trust (POST) and the Santa Clara Valley Open Space Authority (Authority) today announced the purchase of a 159-acre property that widens a vital linkage between the Authority’s Rancho Cañada del Oro and Midpeninsula Regional Open Space District’s (Midpen’s) Sierra Azul open space preserves. This adjacency provides opportunities for connecting recreation options across the two preserves, while securing wildlife habitat and expanding a protected corridor between Highway 17 and Coyote Valley – a high priority area for both organizations in their shared goal of creating habitat linkages for native wildlife. The property, known locally as “the Punch Bowl” because of its bowl-shaped terrain, is now permanently protected as open space. It borders properties in Barrett Canyon that were protected earlier this year by a partnership among POST, the Authority and Midpen. The property was purchased for $400,000, funded in part by a $130,000 grant from the Gordon and Betty Moore Foundation. POST and the Authority are funding the remainder. The land was previously under private ownership. 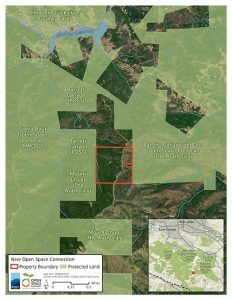 Entirely undeveloped, it features diverse topography and native habitat, including serpentine soils, coast live oak woodland, California bay laurel forest and the headwaters of Barrett Creek, which flows to Almaden Reservoir. The property is now owned and managed by the Authority as part of its Rancho Cañada del Oro Open Space Preserve. With this acquisition, the Authority gains more contiguous management of a critical fire break that helped control the 2016 Loma Fire. The Authority will partner with Midpen to eventually establish trails across the property to connect to an existing network of 37 miles of trails across both Rancho Cañada del Oro and Sierra Azul, including the popular Bay Area Ridge Trail. POST protects open space on the Peninsula and in the South Bay for the benefit of all. As a private nonprofit land trust, POST has been responsible for saving more than 76,000 acres over the last 40 years. POST works with private landowners and public agencies to connect people and nature for the benefit of all. Visit openspacetrust.org for more information. The Santa Clara Valley Open Space Authority conserves the natural environment, supports agriculture, and connects people to nature, by protecting open spaces, natural areas, and working farms and ranches for future generations. Since 1993, the Authority has protected 25,000 acres of open space, preserving the region’s scenic beauty, protecting water resources and other natural capital, and providing outdoor recreation opportunities for Santa Clara Valley residents. Visit openspaceauthority.org for more information. The Gordon and Betty Moore Foundation fosters path-breaking scientific discovery, environmental conservation, patient care improvements and preservation of the special character of the Bay Area. Visit Moore.org or follow @MooreFound.